We Want You ... to be an online "Redhawk Mentor" to our cadets. We are always looking for Air Force officers, particularly Miami alumni, to serve in this important role. 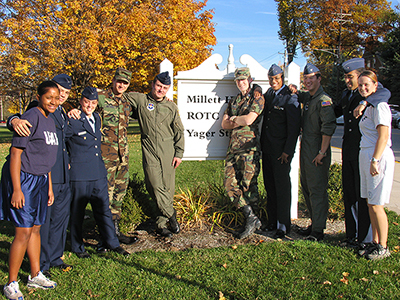 If you would like to serve as a "Redhawk Mentor" for Det 640 cadets, please email us (det640@MiamiOH.edu); tell us your name, email address, AFSC, and duty history highlights. We'll forward your information to cadets interested in your career field. Correspondence will be limited to email unless you decide otherwise, and all contact information will be restricted to cadet use only.